You’ve been warned before—robots are coming for your job. The speed of technological advancement, particularly in smart automation, has sprung countless economic studies and political warnings about how many people are likely to lose their jobs to this rise of the machines. But it’s not an easy number to peg down; estimates range from 5% to 50%. The latest predictions from PricewaterhouseCoopers (pdf) survey the damage for specific countries. Analysts at the consulting firm said that by the early 2030s, 38% of US jobs are at a high risk of automation, more than in Germany, the UK, and Japan. PwC revisited two notable studies on the topic. The first was from 2013, in which Oxford University researchers said that 47% of US jobs would be lost to computerization in the next few decades. Those results were based on whole occupations that could be at risk from automation. The other study was from 2016, in which OECD staff said the figure was actually closer to 10% when analyzing the specific tasks within jobs that were likely to be automated. The PwC analysts took the task-based approach a step further. In addition to breaking down occupations into manual tasks, routine tasks, computation, socials skills, and literacy skills, they included some details about the workers doing the jobs, particularly the education and training required. 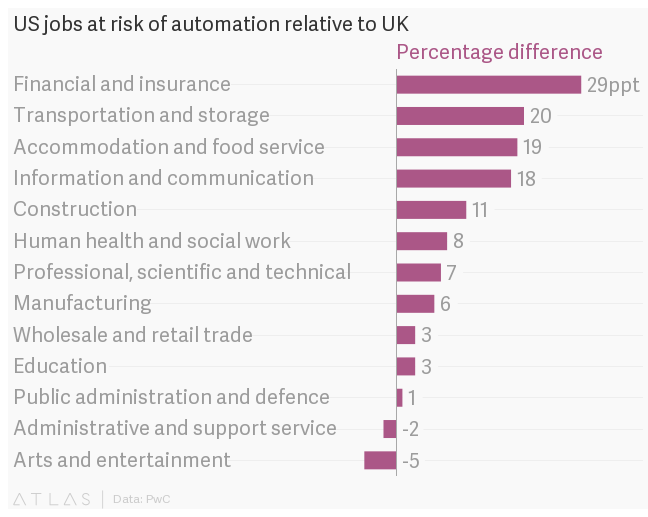 Then, focusing on the UK, PwC looked at the industries with the highest risk of automation, taking into account the proportion of jobs at risk within each sector and its employment share in the overall UK labor market. They found that the wholesale and retail trade sector was most at risk. It’s an industry that employs 15% of the workforce. If PwC is right that 44% of retail jobs are at risk, then 2.3 million jobs just in the UK are on the line. While it’s relatively straightforward to see why German jobs are more susceptible to automation—more people work in manufacturing—the difference is less easily explained for the US. The US and UK have similar services-based economies and employment shares within it. PwC analysts said the difference came from higher risks of automation within specific industries, for example the financial and insurance sector. 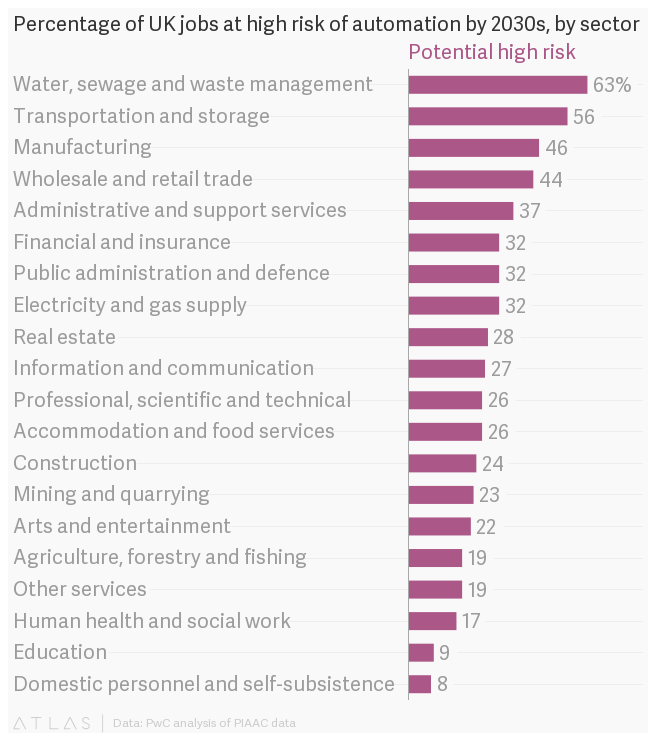 In the US, 61% of these jobs were deemed at high risk compared to just 32% in the UK. The study said that the average education levels for these workers was higher in the UK—a reflection of the fact British financial workers tend to be employed in London working in international markets, whereas more US finance professionals work in the domestic retail finance market. The retail market is “more routine—and so more automatable—then the average finance sector job in the UK, with its greater weight on international finance and investment banking,” the report said. Still, the overall impact on employment from automation is unclear. Some jobs will obviously be lost but others will be created by new technology, while some jobs will be made more efficient by automation. A problem more quickly arises with inequality as high-skilled, well-educated people are likely to fare much better. PwC said this makes the case for government intervention to redistribute the gains of automation. But before you draw up plans for a robot tax or advocate for universal basic income, remember we’ve seen transformative effects from technology before and it could all be OK in the end.